Kyle Koele '13 knows how to move – fast. During a typical day on the Augsburg campus, this fourth-year physics student from Prescott, Wis., races from an early morning shift with the College's Facilities crew to a class in Science Hall—then on to a band rehearsal, a homework meeting, a workout session in the fitness center—and, finally, a keystone course. Studying at Augsburg has been an opportunity for Koele to take on distinct challenges related to his education, his athleticism, and his goals for the future. "I don't like to miss out on anything," Koele said of his demanding schedule. "I go from 6 a.m. to 9 p.m., and it's wearing down on me. I like being active but sometimes it catches up with me, and I have to reevaluate." Often times when Koele "reevaluates," he simply redirects to a new forward course or an additional opportunity. He's just not the type of guy who can take a step backward. Working an on-campus job, earning above-average grades, and leading Augsburg's club lacrosse team requires hard work, and Koele uses his uncommon endurance for these tasks and another particularly tough endeavor. This year, while balancing his commitments as an engaged college student, Koele trained for—and participated in—Tough Mudder events. The Tough Mudder, Spartan Race, Warrior Dash, Rugged Maniac, and Muddy Buddy are all "part of a new genre of athletic event—obstacle mud runs—that has exploded across the country," according to the Los Angeles Times. An estimated 1 million people took part in these "down-and-dirty races," in the United States last year and for many individuals completing a mud run is badge of honor. Koele signed up for the Twin Cities Tough Mudder, an event he described as an "11.5-mile, 26-obstacle course created by British Special Forces to test all-around strength, stamina, mental grit, and camaraderie. "I ran the difficult course in just 2 hours, 31 minutes," Koele said. "It turns out I finished in the top 5 percent, and I was invited to participate in the World's Toughest Mudder Challenge." Koele planned to spend summer 2012 conducting faculty-led, on-campus research through an Office of Undergraduate Research and Graduate Opportunity (URGO) program. After Koele qualified for the World's Toughest Mudder—the culminating event of each year's mud run calendar—he amended his daily schedule to include long-distance jogs, playground workouts, and fitness regimens fit for a body-building movie star in addition to analyzing the earth's ionosphere using satellite data gathered with a research-grade GPS receiver. Conducting research was a way for Koele to use concepts from his degree program in an applied lab setting and to work in a field he enjoys. "In high school, I took physics in my senior year and I fell in love with it," Koele said. "Some people don't get math, but I can analyze a problem and figure it out before I write it down. I can see it in my head." Koele said when he gets stuck on a physics assignment or experiment, he approaches it in much the same way that he would an obstacle in a Tough Mudder race. "I think of a way to deal with the problem and start attacking it," he explained. "If I hit a dead end, I back up and look for a new route." Koele completed his URGO project with David Murr, associate professor of physics. Koele developed computer code in MAT LAB, an engineering software tool, to analyze and visualize large amounts of data. Koele was selected for this project and named a Sundquist Scholar by faculty in Augsburg's science, technology, engineering, and mathematics disciplines who recognized his strong academics and high abilities in a lab setting. "Kyle was working with what I call 'big data,'" Murr said. "He sifted through 3 gigabytes of information per day, and developed the skills needed to accurately analyze that data. He's one of those well-rounded, team-oriented guys who is mature, humble, and has a great sense of humor. He's the guy that will be the glue that holds a team together." 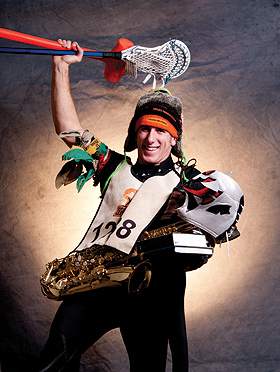 During November, Koele completed the World's Toughest Mudder, lapping a 10-mile course five times in 24 hours and placing in the top 100 of more than 1,000 participants. He encountered 32 obstacles that included a tire drag, water tunnels, and electric shock. These physical and mental challenges were made bearable, in part, by the sense of collaboration and fellowship between himself and the other Mudders. Teamwork comes naturally to Koele, who has helped to double the size the Augsburg club lacrosse team during his tenure as president and who said his favorite part of playing saxophone in the Augsburg Concert and Jazz bands is when rehearsals or ensemble trips nurture an environment of "people coming together and doing what they love, working toward a goal." Robert Stacke, chair of music, works with student musicians who run the gamut from those who will perform and work in the industry for their careers to those who played in high school and want to continue performing through their college years. Koele, a member of the latter group of musicians, earned a scholarship to play at Augsburg. In addition to being a skilled player, Stacke said Koele's hard work ethic and team-minded personality add a great deal to the band. "Kyle brings stability, reliability, and standards" to the ensembles, Stacke said. "His motivation and goal-oriented personality means he has a drive to keep on going through the hard stuff, and it is an inspiration to watch. Kyle is unique and brings much to our groups." After graduating from Augsburg, Koele hopes to use his physics education in a career where he can develop space technology by building new satellites or rovers. Koele said he needs a vocation where he can experiment and do hands-on projects each day. It's unlikely that he could sit behind a desk for long.